Is it possible to forgive someone who will never change? Simply by wanting someone to change, you’re perpetuating your own experience of suffering. 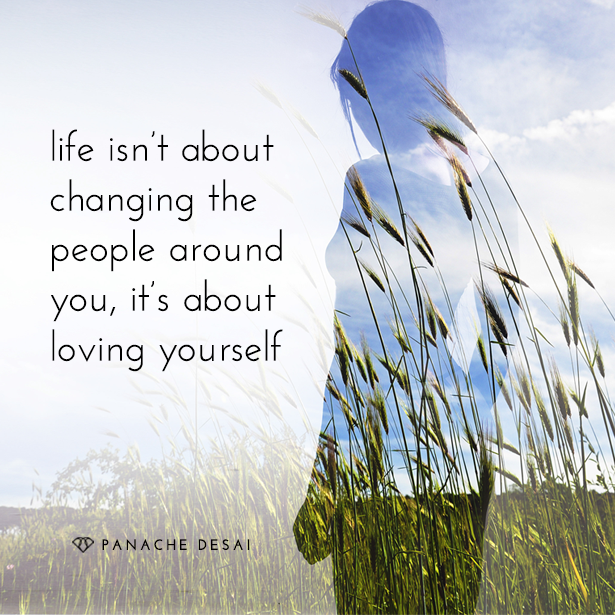 Life isn’t about changing the people around you… It’s about loving yourself. The more you love yourself, the less you’re focused on the people around you and their behaviors. How do you begin to love yourself so that you can forgive someone who will never be different and will never change? Life has a way of naturally restoring order, harmony and balance in people’s lives and sometimes it’s our pushing for something or it’s our wanting life to be different, that doesn’t allow for harmony and balance to be restored. The more we can focus on what we know is best for us and leave others to be in their own evolution, the more we are furthering the expansion of ourselves and everyone in our lives. It’s the attachment to anything needing to be different that creates the suffering. All we can do is love ourselves enough to know that their behavior has nothing to do with us. Hi Sweet Friends, its Panache! I want you to know that life isn’t about changing the people around you, it’s about loving yourself. The more you love yourself, the less you’re focused on people around you and their behaviors. Now I know for many of you in this case, this question relates to a father, or a mother, or a spouse, or a sibling—somebody that’s close to you, somebody that you deeply love and care about, and I want you to know that it is in the wanting that individual to change, that you are perpetuating your experience of suffering. I’ve noticed that change doesn’t work—you know, for example in my life, my father has been a smoker his whole life, and my mother and I have been on a campaign since as early as I can remember to get him to give up smoking—and we’ve been vocal about it and we’ve sent him outside the house to smoke and we’ve made it as inconvenient as possible for him to smoke in our proximity, and yet he has continued to do so until quite recently. It’s almost as though the very second we gave up the need for him to give up smoking, he naturally felt the inner inclination to stop smoking and actively sought the help that he needed to now be cigarette-free for multiple months. We all know at the deepest level what is best for us and the more we can focus on what we know is best for us and leave others to be in their own evolution, the more we are furthering the expansion of ourselves and everyone in our lives. It’s the attachment to anything needing to be different that creates the suffering. In the presence of an angry father, all we can do is love ourselves enough to know that their behavior has nothing to do with us. In the presence of a depressed, manic mother, all we can do is love ourselves enough to know that their behavior has nothing to do with us. And, in the presence of a sibling who is suicidal or who is constantly stuck in cycles of drama or victimhood, all we can do is know and love ourselves enough to know that their choices and decisions, whatever they may be, have nothing to do with us. The more we disengage from this false external belief, that it is about correcting the behaviors of those outside of us, and the more we start to focus on loving ourselves and growing in our foundational platform of self-love—the more life seems to take care of itself powerfully, the more life evolves in ways that we have yet to fully imagine or even acknowledge. And, in that same way where we can meet people where they’re at and we can simply be with them—and of course, if someone’s violent—don’t be around them… Love yourself enough to not be around them. But if what we’re talking about is the majority of instances where somebody’s upset or angry or in drama or is constantly on this hamster wheel of victimhood or whatever that is… In the presence of that, by you being you—you’re offering them an invitation to be themselves. So can you forgive someone who will never be different, who will never change? Give up the need for them to be different. Give up the need for them to change. Allow life to work its alchemy in them as much as it has worked in you and trust and believe that there is promotion and increase in their destiny as much as there is promotion and increase in yours. The more you can let go of any outcomes as they relate to anyone outside of you and the more you focus on your own inner state and the more you focus on your own inner connection (which isn’t selfish) —the more you can begin to emit love and emit peace and harmony into your world which then, in turn, reminds others that this is who they really are. I can’t wait to see what unfolds for you. Post your comments here and let me know how these insights and these awarenesses are impacting you in your life. I love you with all my heart and I thank you for loving me.